Parental Guidance Advised - No real objectionable content, other than the subject itself: death. This movie will not be able to hold the interest of most children, and many adults for that matter. Giovanni is a young school boy who's father is currently working a long ways from home. With his mother ill and in need of help and medicines, Giovanni works both before and after school to help buy the basic necessities for the house. However, since he's always working and is somewhat withdrawn, the rest of the kids at school tease him constantly about the new "otter skin coat" that his father is to bring back for him, amongst other things. The one kid at school who doesn't tease him however, is Campanella; the son of his father's friend. 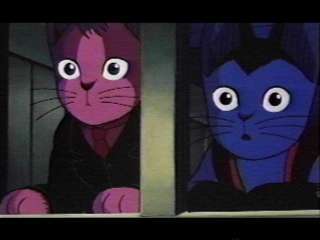 During the evening of the Festival of the Stars, both Giovanni and Campanella find themselves on board a train; this train which will take them to the very edges of the galaxy and possibly beyond. This movie sort of takes you off-guard if you don't know what it's about; and it definitely has a point to make. Recognised by the Ministry of Education in Japan, it deals with the subject of death and does so in a sensitive manner which *shouldn't* give kids nightmares, but will have them in tears. Indeed adults will have a tough time keeping a dry eye assuming that both can get through the movie that is. The main drawback to this movie is the sheer length of the production. It's extremely demanding on one's ability to maintain their interest, and would be even more difficult for kids to watch; either in North America or Japan. The animation is okay although nothing particularly special, but the music is very nice. The voice acting is nothing particularly special in this show either, and really both Giovanni and Campanella are very quiet throughout the movie and the train ride. The *lack* of action more than anything makes things even more demanding, it's very much as though you were taking a ride on a train, people come and go, sometimes it's interesting to look out the window sometimes not, sometimes you take a nap... It's very slow paced and it becomes very tempting to take a nap as things go on.